We are professional supplier of Iloperidone CAS 133454-47-4 that is white crystalline powder with the molecular formula of C24H27FN2O4 and formula weight of 426.48. 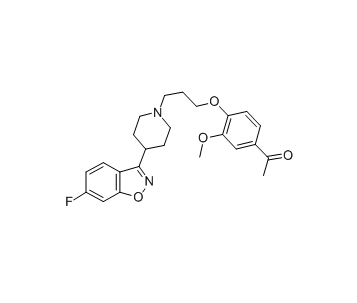 Iloperidone CAS NO 133454-47-4 as an adopamine (D2) and serotonin (5HT2) receptor antagonist and an atypical antipsychotic, is approved for the treatment of schizophrenia. In general case, we have kilograms grade inventory to meet diverse quantity requirement of the customers. Looking for ideal ILOPERIDONE 133454-47-4 Manufacturer & supplier ? We have a wide selection at great prices to help you get creative. All the Iloperidone ILO-522 HP-873 are quality guaranteed. We are China Origin Factory of Iloperidone Named Fanapt 133454-47-4. If you have any question, please feel free to contact us.